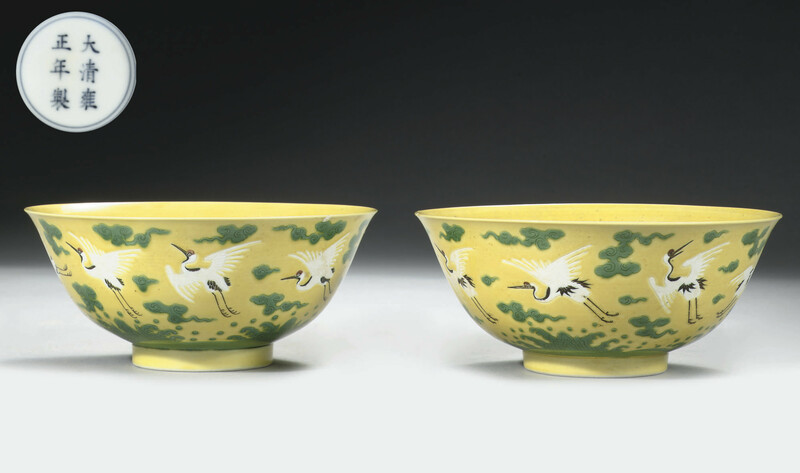 Compare with examples of this pattern and size, the first in the Baur collection illustrated by J. Ayers, Chinese Ceramics in The Baur Collection, vol. 2, Geneva, 2000, p. 83, no. 204 (A542); the second bowl in the Palace Museum is illustrated in Kangxi Yongzheng Qianlong, Hong Kong, 1989, p. 237, no. 66; a bowl, formerly in the Malcolm MacDonald and now in the Gulbenkian Museum of Oriental Art and Archaeology, University of Durham, is illustrated by Legeza, Catalogue, pl. CXXV, no. 332; from the Warre Collection illustrated by R. L. Hobson, The Later Ceramic Wares of China, pl. LIX, fig. 3; and the Victoria and Albert Museum collection, The Handbook to the W. G. Gulland Bequest of Chinese Porcelain, pl. VI (a).